A few months back Tracers and Brillo headed out to see The Deathray Davies on a night when i was stuck in lab. When i later asked how the show went, Tracers told me, "You would really have liked the opening band. In fact, i got you a copy of their EP. Here." And now i am sorely disappointed that i missed French Toast in concert. This is the kind of pop-punk that i like, as opposed to the syrupy sweet stuff Malimus listens to. That is to say, this is music built out of complex drumming, power chords, and heartfelt lyrics, all performed with an eye towards making you bounce along. So who are these people? 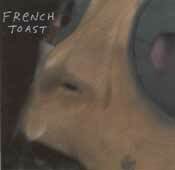 Well, French Toast is a duo consisting of James Canty and Jerry Busher. You might remember James Canty from such bands as Nation of Ulysses and The Make Up. Jerry Busher played on Fugazi's latest long player, The Argument. A good lineage in DC punk. They live up to their roots. There is some amazing guitarwork here, and some great drumming. I am very impressed with Busher's drumming after hearing this EP. There are only 6 tunes, and all of them are quite good. The opener is Breakfast, with Canty wailing "This is what i had for breakfast" over unstoppable drumming and power chords that stay crunchy even in milk. They follow this up with In Veins, a short song with a great, fast guitar melody reminiscent of the early work of The Wedding Present. Canty sings here through some slight echo effect, which gives the song a vague post-punk feel. Like early Jean-Paul Sartre Experience, or perhaps similar in nature (but not execution) to contemporary critical darlings Interpol. Good stuff at any rate. Then Frech Toast mix it up a bit, starting track 3, Skull-head with a long meandering math rock intro. In fact, this song in general is math rockish, only with distorted vocals. Complex rhythms and old school Iggy Pop singing makes a great combination. Who knew? The next track, Bug vs. Man is a three minute instrumental, in which Busher really cuts loose and Canty plays trebly arpeggios. Very nice, and very post-punk. This is followed with a short electronic ambient experiment that they call In Memory. Strange distorted sounds float over Star Trek like synth tones and a wavering drone. It's slightly eerie, and somewhat odd given the other stuff on this EP. However, it really works as a sort of transition. The final track is called Where Did You Go? and it is a simply glorious tune. It starts slowly and rhythmically, building and building until it pops in a flurry of guitars, drumming, and vocals. Excellent. I am very impressed with this release. Sure, the general sounds are things you have heard before (especially if you survived the 80's), but it is all well done. Simple song construction plus competent follow through equals a good listen. So, if you are into the current Post-Punk Revival (and by god you should be), then rush out and try and find a copy of this. That might be somewhat hard, seeing as this is the first release from Arrest Records. Apparently this is their label, but there is no information on this label on the web (go ahead and Google "Arrest Records" -- i dare ya!) However, given their close ties with Fugazi, this album is distributed by Dischord. Which means at the very least you can order it from their site. Overall, this is a great debut, and i hope to see more from French Toast sometime soon. And if they come on tour, i will definitely weasel my way out of class to go.